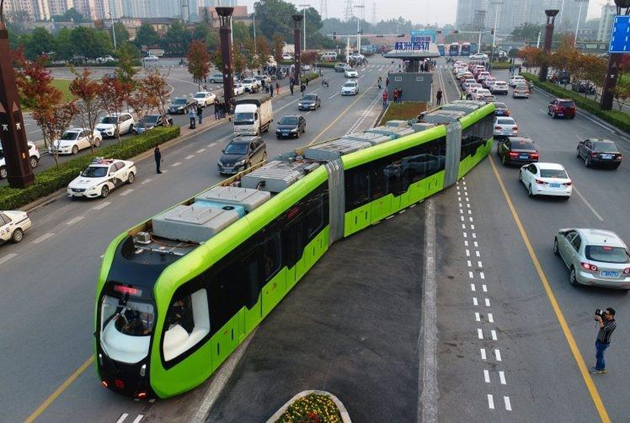 Surprise Surprise – Trackless Trams are in vogue with light rail supporters! For many years we have been trying to remove the emotional ideology in the debate on public transport where there have been clear lines drawn between those who support light rail and outwardly (passionately) reject bus rapid transit. Attempts to try and focus on the levels of service and the cost of such service within a dedicated corridor setting have fallen on deaf ears in many locations in Australia, reinforcing my belief of choice versus blind commitment. What we need is a debate that focusses on value for money within the goals of delivering mobility and accessibility in line with broad goals of efficiency, equity and environmental sustainability (the triple bottom line). To my absolute surprise, we now see that one of the greatest proponents of light rail who has been very critical of any arguments to promote BRT, has said that trackless trams could be the answer to Perth’s traffic woes (Exclusive, Kent Acott, The West Australian, Thursday, 28 December 2017). Experts say the new technology could be a game changer for Perth. It is “trackless” because it is autonomous and guided by on-board optical systems that follow magnetic strips painted on the road. The news story goes on to quote Curtin’s Professor Peter Newman, a well known critic of bus based systems in favour of light rail, who said that “The trackless tram has a number of unique features that makes it particularly attractive, especially the price,” Peter Newman also said. “It is estimated to cost between $10-$17 million per kilometre — about four times less the cost of a standard light rail like the MAX system proposed by the previous Barnett government. It could also be made locally.” “We have been working on light rail for Perth for several decades — we now believe technology like the trackless tram will be a game-changer for Perth and cities like it.” “It is cheap, involves little disruption, can be rapidly brought to market and has all the passenger comfort and ride-quality attributes of light rail — yet it is a new kind of bus on the road.” As a result, it does not require the digging up of streets and disruption to businesses, houses or traffic while it is being built. The trackless tram would be electric and powered by lithium-ion batteries that are recharged at each station in 30 seconds. Planning has begun on this ‘new’ concept of public transport that experts believe will be a game changer for Perth. Despite the clever use of the phrase ‘trackless trams’ to give some continuing emotional attachment to light rail (Hensher 1999), what we are referring to is a high quality BRT system that ticks all the boxes of the Gold Standard (ITDP 2014). Such a BRT system also recognises the value for money proposition where the same level of service can be provided for a cost considerably lower than LRT. Hensher et al. (2019) present evidence from a survey of public transport preferences undertaken in five countries (Australia, UK, Portugal, USA and France) by ITLS and the BRT (VREF) Centre of Excellence 9 http://www.brt.cl/) on the key drivers of community preferences for BRT and LRT. Service levels can be used effectively to deliver value for money BRT over LRT in the exact same corridor (and indeed many more corridors of BRT for the same dollar sum as LRT, as clearly noted by Newman for Perth. We hope that the Perth view of a future bus-based system that delivers exactly what the light rail supporters want will send a signal that BRT has great merit and should not be discarded simply because of some emotional attachment to light rail and a misguided view that light rail can carry more passengers than a bus-based system. What matters is not vehicle capacity but service capacity and BRT definitely delivers on this metric. If we have to make our buses look like light rail to win the debate then so be it! Hensher, D. A. (1999) A bus-based transitway or light rail? Continuing the saga on choice versus blind commitment. Road & Transport Research, 8, 3-21. Hensher, D.A., Balbontin, C. Ho, C. and Mulley, C. (2019) Cross-cultural contrasts of preferences for bus rapid transit and light rail transit, paper presented at the 15th International Conference on Competition and Ownership of Land Passenger Transport (Thredbo 15), Stockholm, Sweden, 13-17 August 2017. (Linked to VREF Centre), full draft 19 May 2017. To appear inJournal of Transport Economics and Policy,January. ITDP (2014) The BRT Standard. New York, United States: Institute for Transportation and Development Policy.